The appointment will last as long as YOU want it to. When you work with the professionals at Toledo New Bath, you can rest assured you will not be pressured into buying anything. We want to work with you on your time schedule to assist you in getting what you want, not what we want to sell. 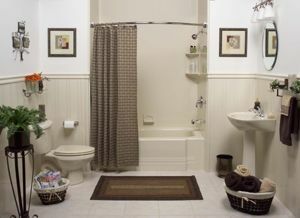 We want to help you create the bath of your dreams in a low-pressure environment. We don’t want you to feel anxious while you are contemplating your new bath so we make our showroom comfortable. Our sales people will work with you to find the products that meet both your needs and your budget. Call us today for a free, no-pressure consultation!